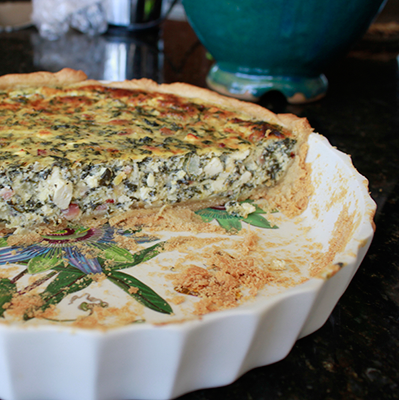 This quiche recipe hails from my favorite vegetarian restaurant in Canberra: Sesame in Kingston. - and use fresh or what we have frozen (Jane). 1. Put flours and butter into a food processor and process until combined. 2. Poor in enough water to make a stiff dough - about 1/2 cup. 3. Press the dough into a quiche pan - pressing out from the center until it covers the sides and is even all over. 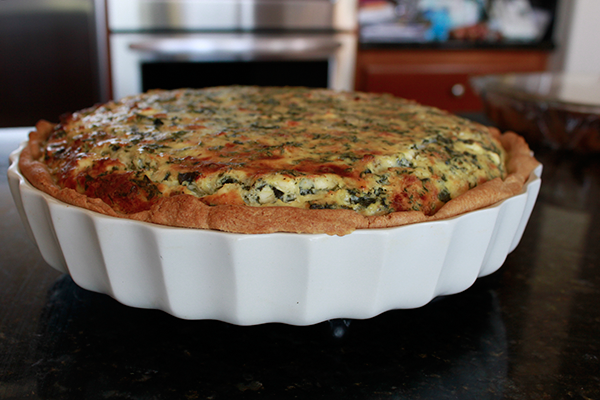 I have a large quiche pan and the pastry is just the right amount. Depending on the size of your pie or quiche pan - you might have enough for two. Don't have a food processor? Then rub the butter into the flour the old fashioned way. The original recipe calls for 2 cups of wholemeal flour - but the family prefers half and half. 1. Sauté onion and bacon (or ham) until onion is cooked. 2. In large bowl combine remaining ingredients and mix to combine. 3. Add onion and bacon and mix to combine. 4. Pour quiche mixture into prepared pastry shell. 5. Cook in oven preheated to 350F for about one hour. Top will be nice and brown.